You can get a discussion going by leaving a comment on the show pages, and as always, you can follow them on Twitter @robcesternino and @keev26. 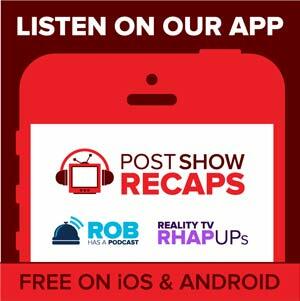 Don’t forget to subscribe to the podcast by going topostshowrecaps.com/seinfelditunes where you can rate and review the podcast. Send in your questions by emailing [email protected]. Tune in next week as the guys will recap “The Apology”. Emails – Finally, Chester chimed in with an array of takes. Amir thought George only wanted Nina because Jerry never got her. Dan the benefactor had Newman’s back when Jerry insulted him in his own apartment, noting that Jerry was out of line. Alex pointed out a continuity error based on a crossover episode of Mad About You. Vicki asked if either of them have tried clams casino. Lindsay asked if they’ve attended a destination wedding. Ariel asked if they think the episode would still be funny if watched in normal order, to which Akiva decided Mike Bloom needs to test the theory. Leading off as always, Johnny De Silveira asked how Jerry and George decided they would go to India for a wedding they weren’t invited to. Rob Cesternino and Akiva Wienerkur laced up their big boots and are ready to bring you the next Seinfeld Post Show Recap. 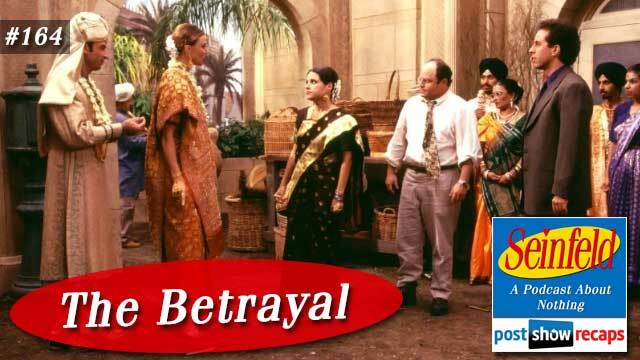 This time the guys discussed “The Betrayal”, which first aired November 20, 1997 as part of season nine. The episode was written by Peter Mehlman and David Mandel.